Over-pronation or -supination stresses the joints and ligaments. The X-SOCKS® Marathon with Supination Bandage stabilises the foot in its natural rolling movement and keeps it from turning inward or outward. The runner is better protected and runs more efficiently. 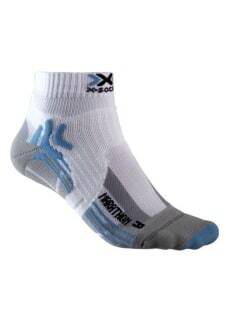 Together with other X-SOCKS® Technology, such as AirConditioning Channel®, AirFlow® AnklePads und Traverse AirFlow Channels®, the sock is the ultimate for the marathon.